Valletta, capital of Malta. Historical Fort St. Elmo is to the left, while domes and steeples pierce the skyline. Attempting to comprehend Malta’s history is like trying to synthesize Western civilization for the last 7,000 years – and most of that’s covering only those glimpses of tangible clues left by the ancients. While not the oldest inhabited of Old World areas, the Maltese archipelago boasts some of the world’s earliest temple ruins from 3600 B.C., predating Egypt’s pyramids by 1100 years. Just as important, if not more so, is Malta’s place in history as one of the most sought after and fought over spots on earth. 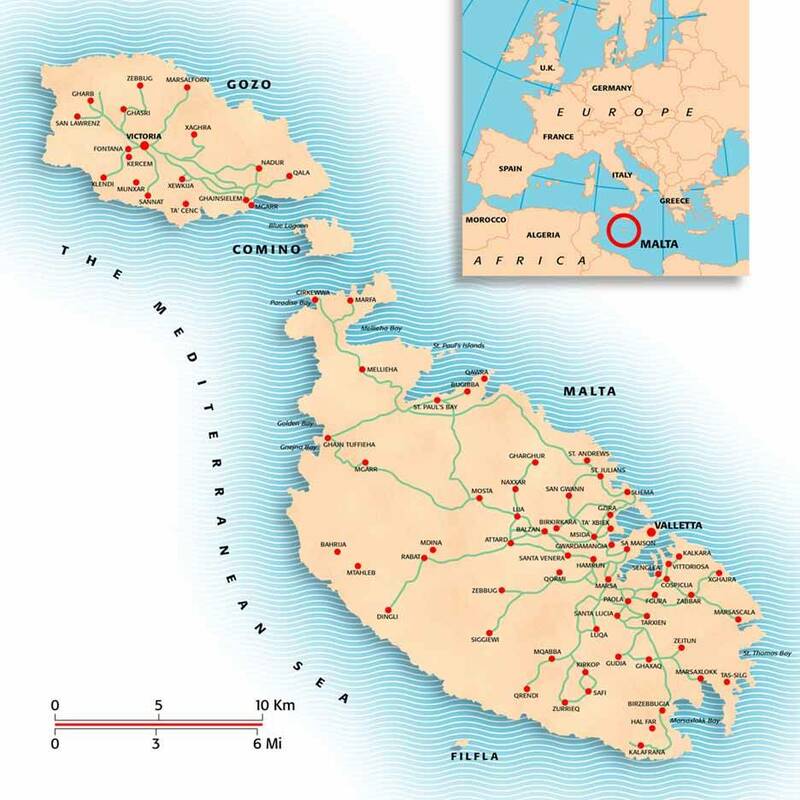 And it is just a spot – the main island, Malta, is a speck in the Mediterranean Sea of just 95 sq. miles (the entire archipelago totals 122 sq. mi.). But as the mantra goes, it’s all about location. The Maltese archipelago lies 50 mi. south Sicily, east of the curve of northern Africa where Tunisia and Libya meet. Most likely it was once part of a land bridge connecting mainland Europe to Africa. First inhabited by Stone Age migrants from Sicily, Malta subsequently was conquered by nearly every pre-Christian civilization of the Mediterranean, followed by half of Europe during the next two millennia: Phoenicians, Carthaginians, Romans, Byzantines, Pre-Ottoman Muslims, Normans, Aragonese, the Holy Roman Empire, the Knights of the Order of St. John, the French, and, finally, the British. Malta’s unique location at the center of the Mediterranean and the cradle of Western civilization made it a focal point of shipping, trade, and political power for centuries. Never a stranger to war and conflict, Malta is probably best known for two epic historical conflicts: the centuries-long battle between the Ottoman Empire and the Knights of Malta (as the spearhead for Christian Europe), and, the battle for control of the Mediterranean in World War II. Re-enactment of Knights of Malta. The white cross on the red background was the standard of their Order and was often worn into battle. Note long tunic on the soldier at center right; this was a tunic often worn into battle. The Knights of Malta began humbly enough as monks of the Order of St. John of Jerusalem who cared for the Christian wounded and sick during the early crusades, and thus became known also as the Knights of St. John, or Knights Hospitallers. (For simplicity’s sake I will refer to them hereafter as the Knights of Malta, their papal name since 1530.) Eventually they evolved a military function in addition to their ministrations, defending Christendom’s tenuous hold on the Holy Lands from the dreaded Saracens (Muslim Arabs). The Saracens, then later, the Ottoman Turks, drove the Knights first from the Levant, then Cyprus and Rhodes, before the Knights finally settled in Malta in 1530, granted to them by Charles V of Spain & the Holy Roman Emperor, for the simple annual tithe of one Maltese (peregrine) falcon. By this time the Knights had become very militaristic and popular, viewed by Christian Europe as the Defenders of the Faith,” their ranks drawn from the most noble (and wealthy) families of Europe. In Rhodes and Malta the militarized Knights fought the Muslims, and Barbary pirates of the Mediterranean eastern rim, yet themselves began to act more as “corsairs” — a gentlemanly term for pirates — as they harassed and plundered non-Christian ships plying the Mediterranean. Certainly, the Ottomans were not pleased, as the pesky Knights were impeding the empire’s westward control of the Mediterranean, their sea trade, and their designs on snaring this island to gain a toehold toward conquering Europe. The Ottoman-Knights conflict culminated in the Great Siege of Malta in 1565 where the greatly outnumbered Knights prevailed after months of bloody battles, reinforced at the last moment by a Spanish-led relief force from Sicily. Both sides sustained extensive casualties, and much of the fortifications and towns surrounding Malta’s greatest asset, its magnificent harbor, lay in ruins. Recognizing Malta’s fragile vulnerability as well as its strength of location, the Grand Master of the Order, Jean de Valette, ordered massive reconstruction of the former forts and towns, as well as a new Maltese home-base for the Knights, the exquisitely designed city of Valletta. Fort St. Elmo, which fell to the Ottomans in 1565, was rebuilt many times over the centuries. Although the Knights lost St. Elmo, they withstood the siege and continued to rule Malta for over 250 years. Reconstructed authentically, Ft. St. Elmo houses Malta’s National War Museum which displays entertaining and educational exhibits on Malta’s war experiences through the centuries. Fast forward 375 years and Malta, now a British colony, found itself again a focal point in the early years of WWII. The British Mediterranean fleet was based in Valletta, battling Axis naval and air forces to control the crucial shipping and supply routes of the Mediterranean. Caught geographically between Axis forces in Africa, Sicily, and the Italian mainland, Malta was pounded from 1940-42 by the Italian and Nazi air forces with 3,343 air raids dropping over 15,000 tons of bombs, the greatest amount of bombing in WWII. By mid-1942 the island’s civilian and military population were near starvation due to the relentless Axis bombing of cities and ports and minefield blockades. The British naval and air forces were nearly out of fuel and sitting ducks on the airfields and in harbor. Malta was only a day or two from surrender when the crippled British tanker Ohio, engines gone, her back broken and decks awash after days of Luftwaffe attacks, limped into the Grand Harbour on August 15, literally towed and pushed the last 40 miles to Valletta by two British destroyers and a few merchant ships, the sole remnants of a 60+ ship Allied relief convoy. The much-needed food and fuel enabled the island to survive long enough for Allied forces to gain control of the North African campaign and begin to turn the tide in the Mediterranean. The Ohio, a British tanker, supported by destroyers and tugs as she limps into Grand Harbour, Valletta on August 15, 1942. Source. Left: The Malta national flag, incorporating the Cross of St. George in the upper left corner. Right: the flag of the Sovereign Military Order of Malta (Knights of Malta). Both flags are often flown together. Source. In the aftermath of WWII, Valletta and the cities surrounding the Grand Harbour were in ruins. Whole areas had to be razed and rebuilt. By and large, the municipalities strove to retain the 16th c. architectural style as envisioned by Grand Master de Valette and his architects, thus maintaining an elegance and individuality recognizable world-wide. The native, honey-hued sandstone also adds a softness and glow unique to Maltese architecture which still, to this day, incorporates distinctive balconies into even the smallest buildings’ facades. Note how narrow the houses are, and that not all have been renovated. The wood-enclosed balconies are a fixture of Maltese architecture. Here, in the tallest building, the balconies are somewhat modified from the traditional. Typical Maltese enclosed balconies or gallerjas. Valletta is built on the ridge of a hill rising to the west of Ft. Elmo. Thus, it’s a steep walk up from the water on both sides of the peninsula forming the city. Malta gained independence from Great Britain in 1964, but remained a constitutional monarchy until full independence as a republic in 1974. In 2004 Malta joined the European Union, and has generally prospered, with tourism a major economic factor. Most recently the country celebrated another milestone, celebrating Valletta’s recognition as the European Capital of Culture for 2018. We attended the opening ceremonies on January 20, enjoying seeing this ancient city aglow in lights, showing off its historic sites with modern 3-D computer imaging displays, acrobatic feats, chorale ensembles, and old-fashioned fireworks. Valletta’s streets were strung with bright banners and colorful lights (below) in celebration as the city’s appointment as the 2018 Capital of Culture for Europe. The beautifully restored Auberge de Castille was used as the “screen” for a stunning 3D display of the history of Malta. Depicted here is the Ottoman fleet’s arrival, initiating the Great Siege of 1565. Malta has a far richer, deeper history than the few events I’ve focused upon – or would want to attempt in this forum. From ancient temples with their perplexing imagery and statuary to medieval times then contemporary life, Malta is a fascinating and complex country which deserves attention and appreciation. Triton Fountain sits before the city gate to Valletta and Ft. St. Elmo at its point. Over the centuries, the Knights of Malta continued to minister to the sick. The Sacra Infermia, built in the 16th century, catered to hundreds at a time. This upper hall, 155 meters long, was reserved for the rich. Each bed, placed between the doors, held only one patient, and behind each door was a private, enclosed commode, one per patient. The hall had plenty of windows and air shafts to provide sunlight and proper ventilation. The poor were consigned to a lower hall, actually much prettier in my opinion, although the poor had to settle for one toilet per three persons. Large doors on the right led to an enormous garden courtyard. Today, both halls are used for ceremonial functions, banquets, and wedding venues. Both halls are part of the huge Mediterranean Conference Center complex next to Ft. St. Elmo. The austere front of St. John’s Co-Cathedral, the church of the Knights of Malta, belies the brilliant, somewhat over-the-top decor inside (see below). The entire floor of St. John’s is covered with elaborate “tombstones” of many Grand Masters and other personages of the Knights of Malta as well as other dignitaries. The cathedral’s interior is primarily Baroque in style, although the church dates back to the late 1500’s. The altarpiece depicts Christ baptized by John the Baptist, the patron saint of the Knights of the Order of St. John, aka the Knights of Malta. The sculpture is by Giuseppe Mazzuoli, a leading High Baroque artist. The main body of the cathedral is lined with chapels representing the eight “Langues” or origins of the knights: Castille-Leon-Portugal, Aragon, Italy, France, Anglo-Bavaria, Auverne, Germany, and Provence, depicted here. The painting is of St. George slaying the dragon. All are in the Baroque style. The arches at the top of Valletta near the city entrance enclose the Upper Barrakka Gardens, a lovely green space created for the Knights for relaxation. The Upper Barrakka Gardens. More trees, shrubs and flowers extend to the left. The lighthouses and entrance to Grand Harbour, on the south side of the Valletta peninsula, is protected by breakwaters extending from Ft. St. Elmo (left) and Ft. Ricasoli (right). Ft. St. Angelo sits on the south side of Grand Harbour, facing Valletta. This imposing fort, originally built in the 1500s, was badly damaged during WWII and has been carefully restored. There are impressive displays and videos that detail the fort’s and Valletta’s history over the ages. These stanchions are actually old cannons, inverted and sunk into concrete for boats to tie up to. Traditional Maltese boats, now used to ferry passengers across Grand Harbour to Valletta. Nearly all Maltese boats have the Eye of Osiris painted on either side of the bow (see below) to ward off evil and bring luck, a practice most likely derived from the Phoenicians who first came to Malta about 2800 years ago. In the background is Fort St. Angelo with the city of Vittoriosa behind — and plenty of monstrous yachts at the mouth of the creek. The Eye of Osiris is painted on Maltese boats to ward off evil. The Eye is found in many seafaring cultures surrounding the Mediterranean and is thought to have come from the ancient Phoenicians. Fort Manoel on the island of the same name in Marsamxett Harbour, on the north side of the Valletta peninsula. The early 18th c. fort was built in the star shape popular at that time. Here you can see two of the five points of the star shape. Off and on in use over the centuries, it was heavily bombed in WWII and reconstruction has only taken place in recent years. The reconstructed facade of Ft. Manoel. The fort has been used as a scenic location for television and films, including the popular Game of Thrones, where it was used for the Great Sept of Baelor, and the execution of Ned Stark. On the other side of Manoel Island is the old Lazaretto Hospital, used to quarantine visitors, particularly those suspected of carrying the bubonic plague in the early 1500s. The oldest extant remains, above, date back to the 1700s. The buildings are now under reconstruction. Valletta and Malta were stunning and far too complex to try and condense into pictures in this one posting. Perhaps a future post will show more of the island and its wonders. Stay tuned to updates that will direct to an additional post on Malta. This entry was posted in Malta, World War II and tagged Cospicua, Grand Harbour Valletta, Knights Hospitallers of St. John, Knights of Malta, Malta in WWII, Maltese architecture, Maltese balconies, Maltese Cross, Ottoman Empire and Malta, Senglea, The Great Siege of Malta, Valletta, Vittoriosa by carolrolnick. Bookmark the permalink.